I agonised over how to review and rate this book. 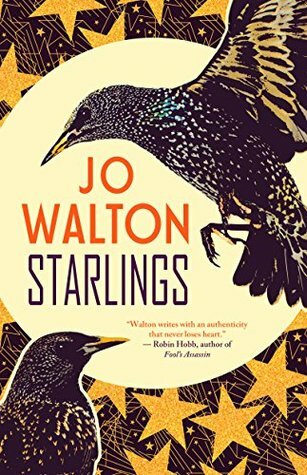 To start with the positive points, Starlings contains a selection of tales ranging from true short stories to vignettes, to poems. Not all of them resonated with me, but there were a few standouts. For example, I particularly enjoyed 'Three Twilight Tales' and 'Unreliable Witness'. Considering the range of material, I would say that there will be something here for everyone. However, one thing put me off this book and that was the use of afterwords at the end of each story. I would have had no issue had they added value, but for the most part they seemed pointless and I really didn't like the way the author used some of them to rant about things such as publishers who hadn't paid her. It seemed so unprofessional. And those afterwords that weren't complaints came across a little too self-congratulatory at times, which didn't give me a positive impression of the author and which, therefore, affected my relationship with her work too. I think I would have enjoyed the collection more overall had those afterwords not been there. As it is, I am giving this 3.5 stars as there were some good tales in there and it was an interesting collection of pieces from throughout the author's career. Ah yikes!! This sounds like it would be a total miss for me. What a lovely cover though! Yes, I, too, thought the cover pretty.